Boscotek high density storage cabinets are designed to offer flexible configuration options allowing you to develop a custom storage solution to meet your specific workplace needs. The BTCD.1500.710 and BTCS.1500.710 cabinets are large, standard depth cabinets, ideal for storing medium to large parts and components. High density storage enables maximum use of available space. By selecting appropriate drawer heights and partitioning system Boscotek High Density cabinets can provide a storage system with minimal space wastage, excellent accessibility and flexibility. Cabinets are constructed using a 2mm rigid interlocking frame, providing excellent structural stability. Zinc seal body and internals provide extra protection in hardwearing industrial applications. Single piece drawer construction provides increased strength. Drawers are available with Single Extension or Full Extension runners. Single Extension can support up to 80kg UDL (uniform distributed load) per drawer. Drawers with Full Extension runners can support between a massive 150kg and 200kg UDL (depending on cabinet width). All drawers use heavy-duty ball bearing runners, secured without screws for fast assembly and reconfiguration. Drawer rails are positioned at 25mm intervals to accommodate flexible arrangement of drawers. 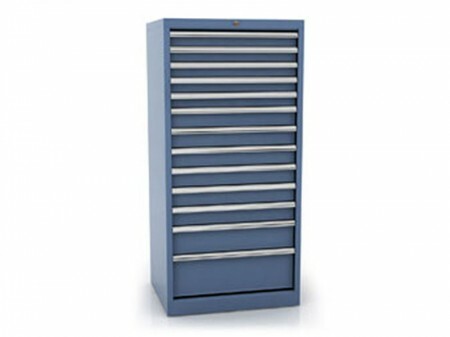 Available in 5 standard sizes, cabinets can include a combination of different drawer sizes and runner types to meet your specific requirements. Internal drawer walls and base are slotted at 25mm intervals to accommodate Boscotek drawer accessories. Accessories enable drawers to be broken down into small compartments for maximum space utilisation. The Boscotek range of drawer accessories includes partitions, dividers, plastic bins, metal trays, tool supports, groove trays and customised foam inserts. Using these components unique internal drawer configurations can be created or users can select from the Boscotek range of standard partitioning sets. Cabinets incorporate a flush-extruded handle running the entire width of the drawer. 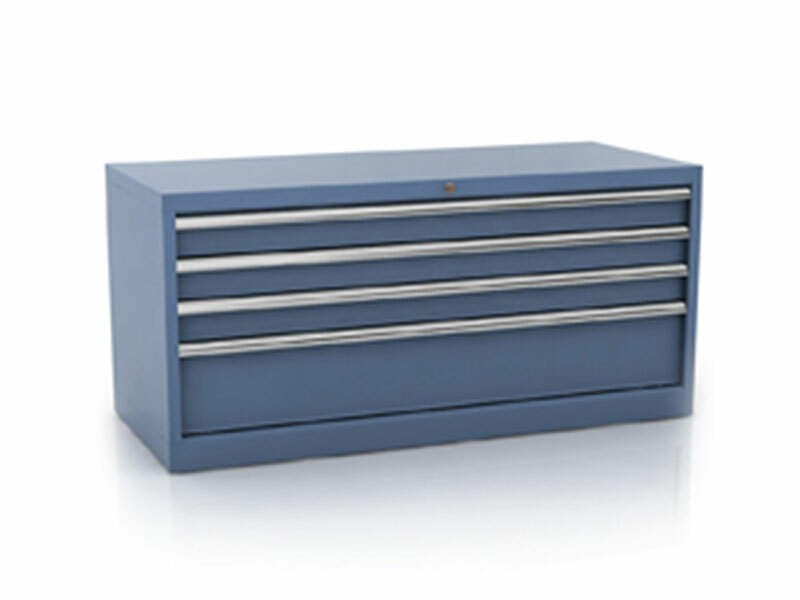 Supplied as standard in clear anodised aluminium, handles are unobtrusive and incorporate a drawer-labelling groove, which allows the insertion of labels to assist in the identification of drawer contents. Where aluminium handles are not suitable, optional extruded, plastic handles can be specified and also include the labelling grove. 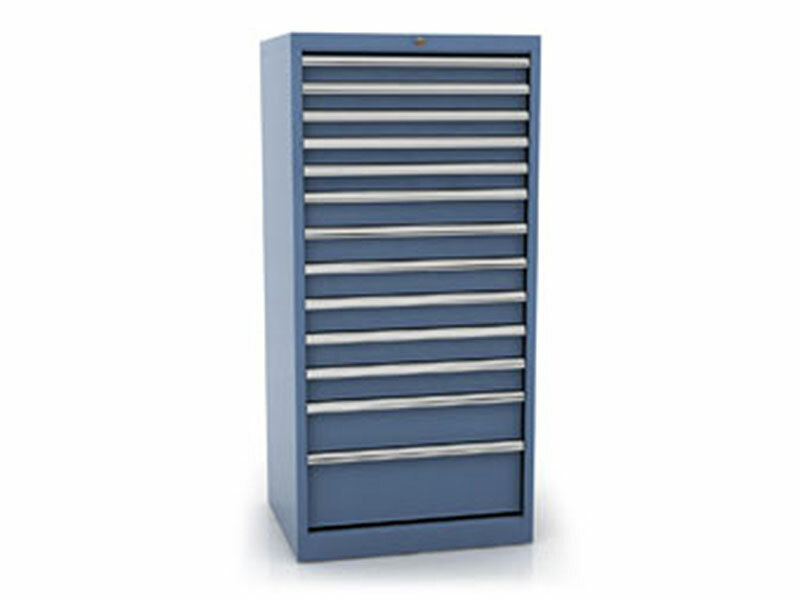 Cabinets incorporate a central rear locking system to securely lock off all drawers within the cabinet. This system offers excellent security – by centrally locating the locking mechanism, locks maintain a high level of integrity and cannot easily be manipulated or flawed through excessive force or leverage. To minimise risk of injury, cabinets are fitted with a unique “True anti-tilt mechanism”. Unlike similar mechanisms on the market, which can be easily flawed the Boscotek “True anti-tilt mechanism” prevents multiple drawers being pulled open at one time. Once a drawer is open all others are locked shut, providing a tangible OH&S benefit. 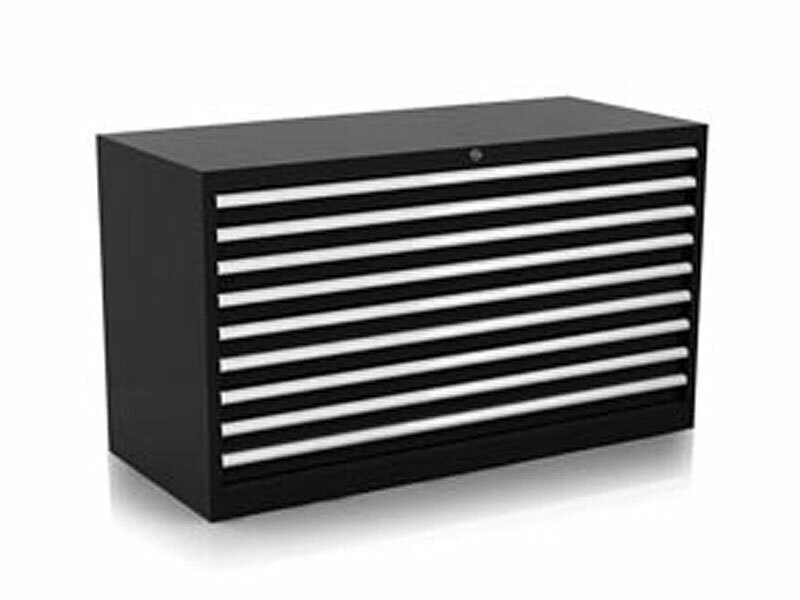 BOSCOTEK™ HD cabinets can be integrated to create a complete storage system. Knockout holes are positioned on the cabinet body to facilitate fastening cabinets together. Cabinets can be connected on side or top. Cabinets can be relocated whilst fully loaded, knockout holes can be used to assist in relocation or two-way forklift base kits are available. Cabinets are supplied standard with levelling feet for use where uneven surfaces may exist; heavy duty castors and forklift bases are available to enable cabinets to be relocated whilst fully loaded. Castors can only be specified on cabinets up to 1200mm high. To maximise the versatility of Boscotek High Density cabinets bench tops can be added to providing a durable work surface. Heavy duty castors are ideal for creating a mobile work environment. Used in conjunction with BOSCOTEK™ products, heavy duty non-marking polyurethane castors provide users with the flexibility to move and reorganise a workspace with minimum effort. Heavy duty castors are capable of handling loads of up to 150kg each and usually come in arrangements of 2 swivel brake and 2 fixed. High density cabinets are unique in their ability to maximise available space within a limited footprint. This feature is achieved using drawer compartmentalisation. Boscotek offers a wide range of drawer configuration accessories including partitions, dividers, plastic bins, metal trays, tool supports, groove trays and customised foam inserts. Using these components unique internal drawer configurations can be created or users can select from the Boscotek range of standard partitioning sets. For more information on accessories available or how to configure a cabinet drawer to maximise available space, download the drawer accessories PDF. Door kits are available to suit Boscotek High Density storage cabinets. Doors incorporate 3-point locks providing concealed shelving for industrial applications. Door kits can be used with combination cabinets covering the shelving and leaving drawers exposed.